As early Homo sapiens spread out from Africa starting around 60,000 years ago, they encountered environmental challenges that they could not overcome with prehistoric technology. Many scientists thus expected that surveys of our genomes would reveal considerable evidence of novel genetic mutations that have recently spread quickly throughout different populations by natural selection—that is, because those who carry the mutations have greater numbers of healthy babies than those who do not. But it turns out that although the genome contains some examples of very strong, rapid natural selection, most of the detectable natural selection appears to have occurred at a far slower pace than researchers had envisioned. Thousands of years ago humans moved for the first time into the tibetan plateau, a vast expanse of steppelands that towers some 14,000 feet above sea level. Although these trailblazers would have had the benefit of entering a new ecosystem free of competition with other people, the low oxygen levels at that altitude would have placed severe stresses on the body, resulting in chronic altitude sickness and high infant mortality. Two years ago a flurry of genetic studies identified a gene variant that is common in Tibetans but rare in other populations. This variant, which adjusts red blood cell production in Tibetans, helps to explain how this group adapted to those harsh conditions. The discovery, which made headlines around the world, provided a dramatic example of how humans have undergone rapid biological adaptation to new environmental circumstances in the recent past. One study estimated that the beneficial variant spread to high frequency within the past 3,000 years—a mere instant in evolutionary terms. The Tibet findings seemed to bolster the notion that our species has undergone considerable biological adaptation of this sort since it first left Africa perhaps 60,000 years ago (estimates range from 50,000 to 100,000 years ago). The transition to high altitude is just one of many environmental challenges Homo sapiens encountered as it migrated from the hot grasslands and shrublands of East Africa to frigid tundras, steamy rain forests and sun-baked deserts—practically every terrestrial ecosystem and climate zone on the planet. To be sure, much of human adaptation was technological—to combat the cold, for instance, we made clothing. But prehistoric technology alone could not have been enough to overcome thin mountain air, the ravages of infectious disease and other environmental obstacles. In these circumstances, adaptation would have to occur by genetic evolution rather than through technological solutions. It was reasonable to expect, then, that surveys of our genomes would reveal considerable evidence of novel genetic mutations that have spread recently throughout different populations by natural selection—that is, because those who carry the mutations have more healthy babies who survive to reproduce than those who do not. Eight years ago my colleagues and I set out to look for the imprints of these profound environmental challenges on the human genome. We wanted to figure out how humans have evolved since our predecessors set out on their relatively recent global journey. To what extent do populations in disparate parts of the world differ genetically because natural selection recently adapted them to different environmental pressures, as in the case of the Tibetans? What proportion of these genetic differences stems instead from other influences? Thanks to advances in technologies for studying genetic variation, we were able to begin to address these questions. The work is still under way, but the preliminary findings have surprised us. It turns out that the genome actually contains few examples of very strong, rapid natural selection. Instead most of the natural selection visible in the genome appears to have occurred over tens of thousands of years. What seems to have happened in many cases is that a beneficial mutation spread through a population long ago in response to a local environmental pressure and then was carried into faraway locales as the population expanded into new territories. For example, some gene variants involved in determining light skin color, an adaptation to reduced sunlight, are distributed according to ancient migration routes, rather than just latitude. That these ancient selection signals have persisted over millennia without new environmental pressures overwriting them indicates that natural selection often operates at a far more leisurely pace than scientists had envisioned. The rapid evolution of a major gene in the Tibetans, it appears, is not typical. As an evolutionary biologist, I am often asked whether humans are still evolving today. We certainly are. But the answer to the question of how we are changing is far more complicated. Our data suggest that the classic natural selection scenario, in which a single beneficial mutation spreads like wildfire through a population, has actually occurred relatively rarely in humans in the past 60,000 years. Rather this mechanism of evolutionary change usually seems to require consistent environmental pressures over tens of thousands of years—an uncommon situation once our ancestors started globe-trotting and the pace of technological innovation began accelerating. Already these findings are helping to refine our understanding not only of recent human evolution but also of what our collective future might hold. For a number of the challenges currently facing our species—global climate change and many infectious diseases, for example—natural selection probably occurs too slowly to help us much. Instead we are going to have to rely on culture and technology. Just a decade ago it was extremely difficult for scientists to trace our species’ genetic responses to our environment; the needed tools just did not exist. 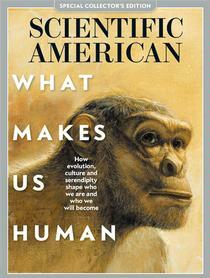 All that changed with the completion of the human genome sequence and the subsequent cataloguing of genetic variation. To understand exactly what we did, it helps to know a bit about how DNA is structured and how small changes can affect its function. The human genome sequence consists of about three billion pairs of DNA nucleotides, or “letters,” that serve as an instruction manual for how to assemble a human [see box above]. The manual is now known to contain a parts list of about 20,000 genes—strings of DNA letters that spell out the information required to build proteins. (Proteins, which include enzymes, do much of the work in cells.) About 2 percent of the human genome encodes proteins, and a somewhat larger fraction is involved in gene regulation. Most of the rest of the genome has no known role. Overall the genomes of any two people are extremely similar, differing in only about one out of every 1,000 nucleotide pairs. Sites where one nucleotide pair substitutes for another are referred to as single-nucleotide polymorphisms, or SNPs (pronounced “snips”), and the alternative versions of the DNA at each SNP are called alleles. Because most of the genome does not encode proteins or regulate genes, most SNPs probably have no measurable effect on the individual. But if a SNP occurs in a region of the genome that does have a coding or regulating function, it may affect the structure or function of a protein or where and how much of the protein is made. In this way, SNPs can conceivably modify almost any trait, be it height, eye color, ability to digest milk, or susceptibility to diseases such as diabetes, schizophrenia, malaria and HIV. When natural selection strongly favors a particular allele, it becomes more common in the population with each generation, while the disfavored allele becomes less common. Eventually, if the environment remains stable, the beneficial allele will spread until everyone in the population carries it, at which point it has become fixed in that group. This process typically takes many generations. If a person with two copies of the beneficial allele produces 10 percent more children and someone with one copy produces 5 percent more, on average, than someone without the beneficial allele, then it will take that allele about 200 generations, or roughly 5,000 years, to increase in frequency from 1 percent of the population to 99 percent of it. In theory, a helpful allele could become fixed in as little as a few hundred years if it conferred an extraordinarily large advantage. Conversely, a less advantageous allele could take many thousands of years to spread. It would be great if in our efforts to understand recent human evolution, we could obtain DNA samples from ancient remains and actually track the changes of favored alleles over time. But DNA usually degrades quickly in ancient samples, thereby hindering this approach. Thus, my research group and a number of others around the world have developed methods of examining genetic variation in modern-day humans for signs of natural selection that has happened in the past. One such tactic is to comb DNA data from many different people for stretches that show few differences in SNP alleles within a population. When a new beneficial mutation propagates rapidly through a group because of natural selection, it takes a surrounding chunk of the chromosome with it in a process called genetic hitchhiking. As the frequency of the beneficial allele increases in the group over time, so, too, do the frequencies of nearby “neutral” and nearly neutral alleles that do not affect protein structure or amount appreciably but ride along with the selected allele. The resulting reduction or elimination of SNP variation in the region of the genome containing a beneficial allele is termed a selective sweep. The spread of selected alleles by natural selection can also leave other distinctive patterns in the SNP data: if an existing allele suddenly proves particularly helpful when a population finds itself in new circumstances, that allele can reach high frequency (while remaining rare in other populations) without necessarily generating a hitchhiking signal. Over the past few years multiple studies, including one my colleagues and I published in 2006, have identified several hundred genome signals of apparent natural selection that occurred within the past 60,000 years or so—that is, since H. sapiens left Africa. In a few of these cases, scientists have a pretty good grasp on the selective pressures and the adaptive benefit of the favored allele. For example, among dairy-farming populations in Europe, the Middle East and East Africa, the region of the genome that houses the gene for the lactase enzyme that digests lactose (the sugar in milk) shows clear signs of having been the target of strong selection. In most populations, babies are born with the ability to digest lactose, but the lactase gene turns off after weaning, leaving people unable to digest lactose as adults. Writing in the American Journal of Human Genetics in 2004, a team at the Massachusetts Institute of Technology estimated that variants of the lactase gene that remain active into adulthood achieved high frequency in European dairy-farming groups in just 5,000 to 10,000 years. In 2006 a group led by Sarah Tishkoff, now at the University of Pennsylvania, reported in Nature Genetics that they had found rapid evolution of the lactase gene in East African dairy-farming populations. These changes were surely an adaptive response to a new subsistence practice. Researchers have also found pronounced signals of selection in at least half a dozen genes involved in determining skin, hair and eye color in non-Africans. Here, too, the selective pressure and adaptive benefit are clear. As humans moved out of their tropical homeland, they received reduced ultraviolet radiation from the sun. The body requires UV radiation to synthesize vitamin D, an essential nutrient. In the tropics, UV radiation is strong enough to penetrate dark skin in amounts needed for vitamin D synthesis. Not so in the higher latitudes. The need to absorb adequate amounts of vitamin D almost certainly drove the evolution of lighter skin color in these locales, and changes in these genes that bear signals of strong selection enabled that adaptive shift. Selection signals also show up in a variety of genes that confer resistance to infectious diseases. For instance, Pardis Sabeti of Harvard University and her colleagues have found a mutation in the so-called LARGE gene that has recently spread to high frequency in the Yoruba people of Nigeria and is probably a response to the relatively recent emergence of Lassa fever in this region. Those examples and a small number of other cases provide strong evidence of natural selection acting quickly to promote helpful alleles. For most of the rest of the hundreds of candidate signals, however, we do not yet know which environmental factors favored the spread of the selected allele, nor do we know what effect the allele exerts on the people who harbor it. Until recently, we and others interpreted these candidate signals to mean that there have been at least a few hundred very rapid selective sweeps within the past 15,000 years in several human populations that have been studied. But in newer work my colleagues and I have found evidence suggesting that instead most of these signals are not actually the result of very recent, rapid adaptation to local conditions at all. A closer look at the selection signals in these and other data reveals another curious pattern. Most of the alleles with the most extreme frequency differences between populations—those that occur in nearly all Asians but no Africans, for example—do not exhibit the strong hitchhiking signals one would expect to see if natural selection swiftly drove these new alleles to high frequency. Instead these alleles seem to have propagated gradually during the roughly 60,000 years since our species set out from Africa. In light of these observations, my collaborators and I now believe that textbook selective sweeps—in which natural selection drives an advantageous new mutation rapidly to fixation—have actually occurred fairly rarely in the time since the H. sapiens diaspora began. We suspect that natural selection usually acts relatively weakly on individual alleles, thus promoting them very slowly. As a result, most alleles experiencing selection pressure may attain high frequency only when the pressure persists for tens of thousands of years. Our conclusions may seem paradoxical: if it usually has taken 50,000, not 5,000, years for a helpful allele to spread through a population, how would humans ever manage to adapt quickly to new conditions? Although the best understood adaptations arise from changes in a single gene, it may be that most adaptations do not arise that way but rather stem from genetic variants having mild effects on hundreds or thousands of relevant genes from across the genome—which is to say they are polygenic. A paper published in 2010, for example, identified more than 180 different genes that influence human height, and certainly many more remain to be found. For each of these, one allele increases average height by only about one to five millimeters compared with another allele. When natural selection targets human height—as has occurred in the pygmy populations that live in rain forest habitats in Africa, Southeast Asia and South America, where small body size may be an adaptation to the limited nutrition available in these environments—it may operate in large part by tweaking the allele frequencies of hundreds of different genes. If the “short” version of every height gene became just 10 percent more common, then most people in the population would have a larger number of “short” alleles, and the population would be shorter overall. Even if the overall trait were under strong selection, the strength of selection on each individual height gene would still be weak. Because the selection acting on any one gene is weak, polygenic adaptations would not show up in genome studies as a classic signal of selection. Thus, it is possible that human genomes have undergone more adaptive change recently than scientists can yet identify by examining the genome in the usual way. As to whether humans are still evolving, it is difficult to catch natural selection in the act of shaping present-day populations. It is, however, easy to imagine traits that might be affected. Infectious diseases such as malaria and HIV continue to exert potent selection forces in the developing world. The handful of known gene variants that provide some measure of protection against these scourges are probably under strong selective pressure because people who carry them are more likely to survive and live to have many more children than those who do not. A variant that shields carriers from the vivax form of malaria has become ubiquitous in many populations in sub-Saharan Africa. The variants that protect against HIV, meanwhile, could spread throughout sub-Saharan Africa in hundreds of years if the virus were to persist and continue to be thwarted by that resistance gene. But given that HIV is evolving faster than humans are, we are more likely to overcome that problem with technology (in the form of a vaccine, for example) than with natural selection. Still, the rate of change of most traits is glacially slow compared with the rate at which we change our culture and technology and, of course, our global environment. And major adaptive shifts require stable conditions across millennia. Thus, 5,000 years from now the human milieu will no doubt be very different. But in the absence of large-scale genomic engineering, people themselves will probably be largely the same. Positive Natural Selection in the Human Lineage. P. C. Sabeti et al. in Science, Vol. 312, pages 1614–1620; June 16, 2006. The Role of Geography in Human Adaptation. Graham Coop et al. in PLoS Genetics, Vol. 5, No. 6, Article No. e1000500; June 5, 2009. Measuring Selection in Contemporary Human Populations. Stephen C. Stearns et al. in Nature Reviews Genetics, Vol. 11, pages 611–622; August 10, 2010. Classic Selective Sweeps Were Rare in Recent Human Evolution. Ryan D. Hernandez et al. in Science, Vol. 331, pages 920–924; February 18, 2011. Evidence of Widespread Selection on Standing Variation in Europe at Height-Associated SNPs. Michael C. Turchin et al. in Nature Genetics, Vol. 44, pages 1015–1019; September 2012. JONATHAN K. PRITCHARD is professor of human genetics at the University of Chicago and a Howard Hughes Medical Institute investigator. He studies genetic variation within and between human populations and the processes that led to this variation.